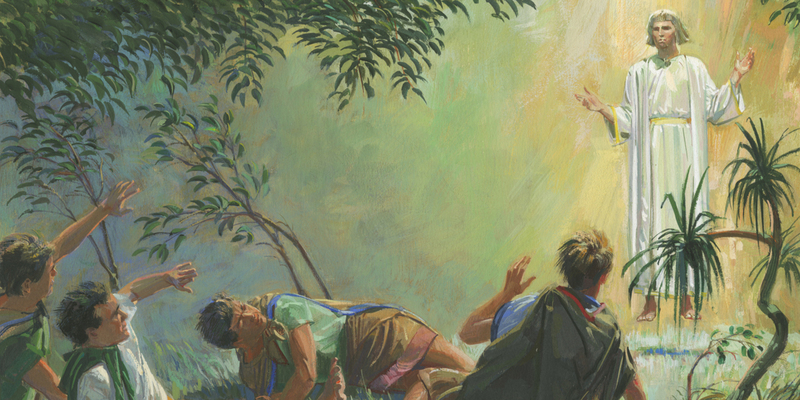 Most Latter-day Saints are familiar with Joseph Smith’s First Vision through the canonical account found in the Pearl of Great Price (Joseph Smith—History 1:15–20), but this was not the only time Joseph told people about his First Vision. Joseph told the story on many occasions. Today, four different firsthand accounts and a handful of secondhand account survive.1 These various accounts make Joseph Smith’s vision “the best-documented theophany—vision of God—in history,”2 and when studied together can enhance a person’s understanding of that foundational event. This is not to say that either Joseph or Alma made things up as they went along. Rather, their variation in details seems to have been prompted by their varying audiences and inspired by what they had been going through in their individual lives.19 In the 1832 account, for example, Joseph focused on the esence of the Savior and only alluded to the presence of the Father because he was focusing more on the atoning power of Christ.20 Yet in both the case of Alma and Joseph, the retellings have all the hallmarks of a genuine memory being told and retold over a lifetime. When seen together, the different accounts create a coherent picture that it what one would expect from a real story being told at different times to different audiences. Alma and Joseph Smith drew strength from their spiritual experiences and used them to teach others. In the same way, modern readers of the Book of Mormon can return repeatedly to the spiritual experiences in their lives as a source of strength. They can also, like Alma and Joseph, repeatedly ponder the significance of these events and apply their spiritual experiences to their daily religious practice, drawing lesson after lesson from the same experience at different points in their lives, depending on their circumstances. S. Kent Brown, “Alma’s Conversion: Reminiscences in His Sermons,” in The Book of Mormon: Alma, The Testimony of the Word, ed. Monte S. Nyman and Charles D. Tate, Jr. (Provo, UT: Religious Studies Center, Brigham Young University, 1993), 141–156. John W. Welch, “Three Accounts of Alma's Conversion,” in Reexploring the Book of Mormon: A Decade of New Research, ed. John W. Welch (Salt Lake City and Provo, UT: Deseret Book and FARMS, 1992), 150–153. 1. The Church and Brigham Young University, in numerous books and journals, have published for many years extensive resources on the various accounts of the First Vision. Beginning in 1969, Dean C. Jessee published “The Early Accounts of Joseph Smith’s First Vision,” in BYU Studies, 9 no. 3 (1969): 275-94, followed soon by James B. Allen, “Eight Contemporary Accounts of Joseph Smith’s First Vision – What Do We Learn from Them,” Improvement Era 73 (April 1970): 4–13; and Milton V. Backman Jr., Joseph Smith’s First Vision: Confirming Evidences and Contemporary Accounts (Salt Lake City: Bookcraft, 1971; 2nd edition, 1980). See also Milton V. Backman Jr., “Joseph Smith’s Recitals of the First Vision,” Ensign, January 1985, 8–17; and articles in the Encyclopedia of Mormonism (1992). More recently, see Richard L. Anderson, “Joseph Smith’s Testimony of the First Vision,” Ensign, April 1996, 10–21; Dean C. Jessee, Mark Ashurst-McGee, and Richard L. Jensen, eds., Journals, Volume 1:1832–1839, The Joseph Smith Papers (Salt Lake City, UT: Church Historian’s Press, 2008); Karen Lynn Davidson, David J. Whittaker, Mark Ashurst-McGee, and Richard L. Jensen, eds., Histories, 1832–1844, The Joseph Smith Papers (Salt Lake City, UT: Church Historian’s Press, 2012); Steven C. Harper, “The First Vision: A Narrative from Joseph Smith’s Accounts,” Church History, April 27, 2016; “First Vision Accounts” Gospel Topics, online on lds.org; and Elder Richard J. Maynes, “The Truth Restored,” CES Worldwide Devotional for Young Adults, May 1, 2016, online on lds.org. For important current studies about the First Vision, see Samuel Alonzo Dodge and Steven C. Harper, Exploring the First Vision (Provo, UT: Religious Studies Center, Brigham Young University, 2012); Richard L. Bushman, Joseph Smith: Rough Stone Rolling (New York, NY: Vintage Books, 2005), 30–56; Matthew B. Brown, A Pillar of Light: The History and Message of the First Vision (American Fork, UT: Covenant Communications, 2009); Steven C. Harper, “Suspicion or Trust: Reading the Accounts of Joseph Smith’s First Vision,” in No Weapon Shall Prosper: New Light on Sensitive Issues, ed. Robert L. Millet (Salt Lake City and Provo, UT: Deseret Book and Religious Studies Center, Brigham Young University, 2011), 63–76; Steven C. Harper, Joseph Smith’s First Vision: A Guide to the Historical Accounts (Salt Lake City, UT: Deseret Book, 2012); Matthew B. Christensen, The First Vision: A Harmonization of 10 Accounts from the Sacred Grove (Springville, UT: Cedar Fort, 2014); Steven C. Harper, “Remembering the First Vision,” in A Reason for Faith: Navigating LDS Doctrine & Church History, ed. Laura Harris Hales (Salt Lake City and Provo, UT: Deseret Book and Religious Studies Center, Brigham Young University, 2016), 7–20. 2. Harper, Joseph Smith’s First Vision, 1. 3. See Acts 9:3–30; 22:6–21; 26:12–21; see in addition 2 Corinthians 11:32–33 and Galatians 1:15–24. 4. John A. Tvedtnes, “The Voice of an Angel,” in Book of Mormon Authorship Revisited, ed. Noel B. Reynolds (Provo, UT: FARMS, 1997), 312. For comparison of Paul’s various accounts, see John A. Tvedtnes, “Variants in the Stories of the First Vision of Joseph Smith and Apostle Paul,” Interpreter: A Journal of Momron Scripture 2 (2012): 73–86. 5. On comparing Alma’s accounts, see John W. Welch, “Three Accounts of Alma's Conversion,” in Reexploring the Book of Mormon: A Decade of New Research, ed. John W. Welch (Salt Lake City and Provo, UT: Deseret Book and FARMS, 1992), 150. On comparing Joseph Smith’s accounts, see James B. Allen and John W. Welch, “The Appearance of the Father and the Son to Joseph Smith in 1820,” in Opening the Heavens: Accounts of Divine Manifestations 1820-1844 (Salt Lake City, UT: Deseret Book and BYU Press, 2005; 2nd edition, 2017), 35-75. 6. Welch, “Three Accounts of Alma’s Conversion,” 151. 7. “God did rack my soul” (Alma 36:14) “with eternal torment” (Alma 36:12). “I cried . . . have mercy on me, who am in the gall of bitterness” (v. 18). “I could remember my pains no more” (v. 19). “What marvelous light” (Alma 36:20). “I had been born of God” (v. 23). 8. Welch, “Three Accounts of Alma’s Conversion,” 151. 9. Welch, “Three Accounts of Alma’s Conversion,” 151. 10. See John W. Welch and J. Gregory Welch, Charting the Book of Mormon: Visual Aids for Personal Study and Teaching (Provo, UT: FARMS, 1999), chart 106. 11. Welch, “Three Accounts of Alma’s Conversion,” 151. 12. Welch, “Three Accounts of Alma’s Conversion,” 151. 13. Welch, “Three Accounts of Alma’s Conversion,” 152. 14. Welch, “Three Accounts of Alma’s Conversion,” 152. 15. Welch, “Three Accounts of Alma’s Conversion,” 152. 16. Welch, “Three Accounts of Alma’s Conversion,” 152. See also Book of Mormon Central, “Why Was Alma Converted? (Alma 36:21),” KnoWhy 144 (July 15, 2016); John W. Welch, “A Masterpiece: Alma 36,” in Rediscovering the Book of Mormon: Insights You May Have Missed Before, ed. John L. Sorenson and Melvin J. Thorne (Salt Lake City and Provo, UT: Deseret Book and FARMS, 1991), 114–131. 17. Welch, “Three Accounts of Alma’s Conversion,” 152. Welch also noted that “Alma 38 is equally interesting. It presents essentially the first half of the chiasm found in Alma 36, up to the climactic turning point, before shifting into hortatory speech admonishing his second son. Having given the doubled version to his eldest son, Helaman, in Alma 36, Alma evidently felt no need to give the fully repeated structure to Shiblon in Alma 38. 18. Welch, “Three Accounts of Alma’s Conversion,” 153. 19. See Allen and Welch, “Appearance of the Father and Son,” 37. 20. Allen and Welch, “Appearance of the Father and Son,” 63. 21. Compare Alma 5:7–14 to Alma 36. See S. Kent Brown, “Alma’s Conversion: Reminiscences in His Sermons,” in The Book of Mormon: Alma, The Testimony of the Word, ed. Monte S. Nyman and Charles D. Tate, Jr. (Provo, UT: Religious Studies Center, Brigham Young University, 1993), 144. 22. Welch, “Three Accounts of Alma’s Conversion,” 153. 23. Allen and Welch, “Appearance of the Father and the Son,” 70.